As you’d expect, here at Disconnected Press, we’ve been keeping an eye on the campaign trail (in between comic cons, deadlines and preparing Issue 3 of Everyone’s Favourite Comic…). 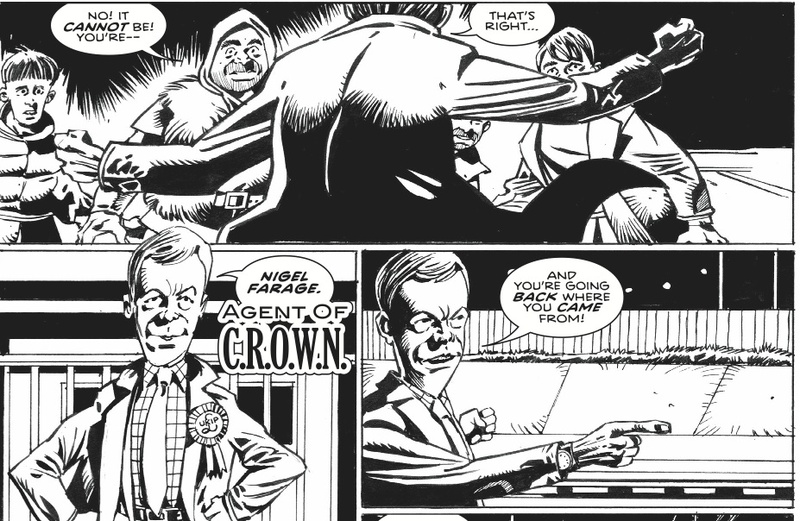 We thought we’d share a few little moments with you, and give you another reminder to purchase your copy of CROSS, our comic anthology of political satire and voting intentions…. Bless him, just when you thought he was gone, he pops back up like the proverbial. He owned St George’s Day by doing what everyone else was doing: getting drunk: The Guardian kindly provided a drink-by-drink rundown and listed the karaoke highlights of the evening – http://bit.ly/1Efe3FF. It’s easy to be flip about Nigel, to point out how this man of the people had a £34,000 a year education and a healthy career in commodities trading before he became a politician. It’s easy to underestimate him. That said, it’s easy to overestimate him too. One good thing that has come from the disproportionate media coverage of Nigel is that it’s forced the media into giving more coverage to other minority parties – many of whom have a much stronger chance of winning some seats than UKIP does. So, thank you, Nigel, for helping give a voice to the Scots, the Welsh, the Greens and even the Lib Dems. You’re a real gent. What’s going on with Ed? #Milifandom was a bit of a surprise – and I will be mightily disappointed if I find out it was a campaign tactic from some smart alec at Labour Party HQ. But it’s amazing how a bunch of people who were saying “he’s weird” have gone very quiet based on the power of other people saying “he’s allright, actually”. This is political debate at its most refined. 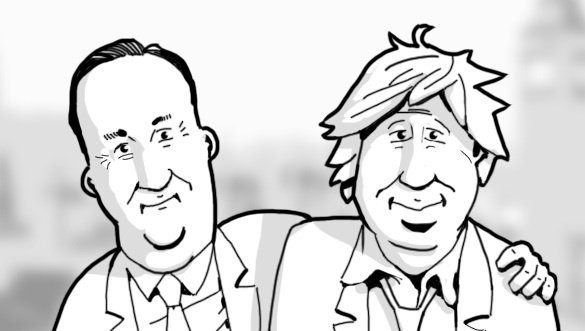 To be honest, any excuse to use this pic of Dave and Boris, drawn by Alwyn Talbot – makes me chuckle every time. The thing I’ve noticed about Dave on the campaign trail… well, I haven’t really noticed him at all. Apart from when he forgot which football team he supports. Oh, and when he tried to sell off all the affordable housing – yeah, that was a corker. But obviously, there was this: http://www.bbc.co.uk/news/election-2015-32223486. Because maybe there is a new kind of politics on its way. Just over a week to go. Between now and then, we’ll be following proceedings with an eager eye and making a special appearance at one of our favourite comic stores for Free Comic Book Day (this Saturday – watch this website for details!). On the night itself, we’ll be up late, watching and counting with the rest of you, to see what kind of colour combination we end up with for the next five years. Edinburgh Comic Convention – here we come! This weekend will see the Disconnected Press tour bus (um, well, us on a train) heading north of the border for Edinburgh Comic Convention. The convention runs on Saturday and Sunday at Potterow, 5/2 Bristo Square, Edinburgh EH8 9AL. Tickets can be bought on the door and all the timings etc are available at www.heroconventions.com. Let us help you survive the next month of election campaigning with our sideways glance at the world of politics, CROSS. 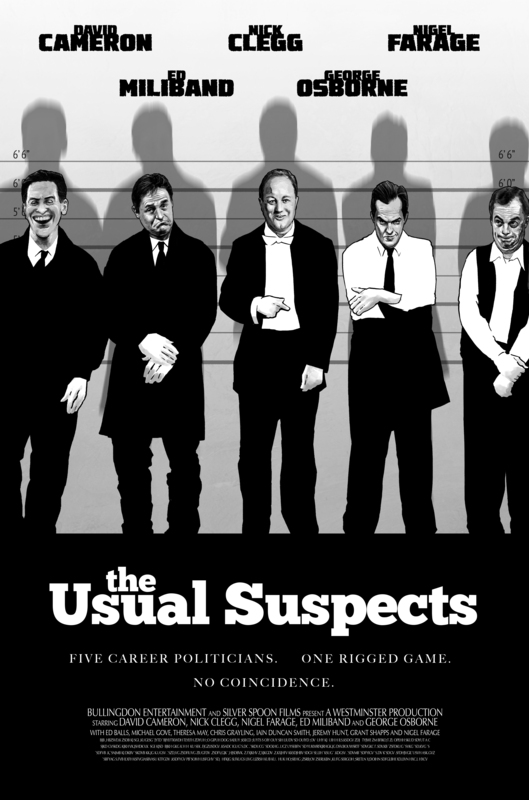 64 pages of satire, a tablespoon of rage, a sprinkling of Boris and a good dollop of Farage. Plus a pot plant. And the devil. Email lizzie@disconnectedpress.co.uk and we can arrange for a copy to be sent to you with payment by Paypal or bank transfer. Visit our online shop at Comicsy, the UK’s trusted marketplace for independent comics; there you can pay by Paypal, debit card or credit card. No excuses, now. 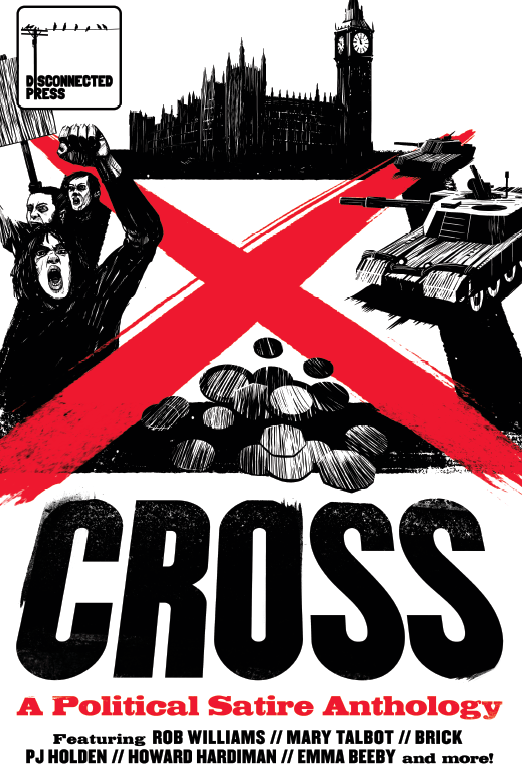 Get your mitts on a copy of CROSS, think about the things you like in the world and the things you don’t and whatever you do, VOTE.